We can all do our part to reduce energy usage on Haida Gwaii as we prepare for more sustainable, community-based and renewable energy. Reducing energy can be simple, free & very effective. Here are some resources that can help you save electricity in your home. 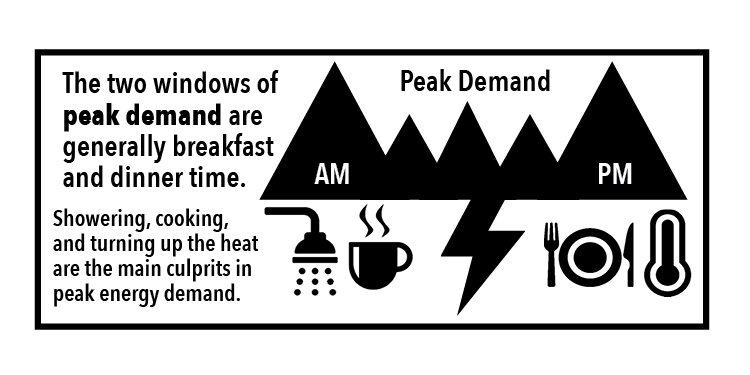 Your hydro bill is measured in kilowatt hours (kWh). A kWh is a unit of energy equivalent to one kilowatt (or 1,000 watts) of power expended for one hour of time. To calculate energy consumption costs, multiply the unit wattage by the number of hours you use it to find the number of watt-hours consumed or produced each day. There are a number of ways that you can track your energy usage. Some homeowners track their electrical usage online through BC Hydro. You can create a MyHydro Profile on their website. BC Hydro’s Cost Calculator helps you find the approximate cost and electrical usage of different appliances in your house. The Online calculator also provides a tool that helps you understand how your bills add up. Kill-A-Watt Electrical monitors help you determine the efficiency of specific appliances. You can purchase these at home hardware stores. Rainforest Energy Monitors help you track your home’s total energy usage. They are available for purchase through BC Hydro’s website. There are also a number of home improvements that can help to increase the energy efficiency of your home. The amount of work required will depend on many things, such as: your budget; the type of house or apartment; building orientation; construction; type of heating systems; and, of course, your lifestyle. Here are a few websites and recommendations that can help you in your home efficiency endeavours. BC Home Energy Coach offers a long list of Do-It-Yourself projects. Fortis BC also provides a full list of DIY projects ranging from installing insulation to changing your faucet aerator. Refrigerator repairs are another project you can probably tackle without hiring an expert. If your fridge seal is damaged or broken, that means you’re wasting energy and dollars. WikiHow offers a how-to guide to this and many more home repairs that you can undertake. Natural Resource Canada provides great online tools to help you find energy star certified appliances. Inspect heating and cooling equipment annually, or as recommended by the manufacturer. If you have a forced-air furnace, check your filters and replace them as needed. Generally, you should change them about once every month or two, especially during periods of high usage. Have a professional check and clean your equipment annually. The City of Vancouver provides a wealth of resources from green landscaping to green home renovation guides. Even with all the natural elements -- sun, wind, air, and water -- residential renewable energy is not always feasible or attainable at the household level. If you are considering a renewable energy installation for your house and need some expert advice, here are a couple resources that may help you along the way. BC Hydro offers information on their net-metering application and describes how grid-tied systems work. See Generating your own electricity for more information. The Regional District of Nanaimo has provided one of the most clear and comprehensive guides available for residential renewable energy. BC Hydro can provide a number of incentives, rebates, and competitions. Check out their website for Savings & rebates. CMHC offers a refund up to 25% for loans to buy, build, or renovate for energy-efficiency using CMHC-insured financing. See Energy-efficient Housing Made More Affordable with Mortgage Loan Insurance. Through their Energy-Efficient Housing program, renovating or buying an energy-efficient homes are eligible for premium savings with Genworth Canada insurance. NRCAN promotes energy efficiency with a variety of different “perks”. Check out their Rebates and incentives for current opportunities. The local credit union often offers different Loans & Credit or Mortgage options that might be applied to energy efficiency upgrades. Before investing in major renovations or renewable energy installations, you may want to consider finding a contractor to help. There are local businesses and regional companies who specialize in energy assessments, energy efficient retrofits, and clean energy installations. HAKAI supply and installation of grid-tied solar energy systems, diesel offset renewable energy systems, off-grid community scale renewable energy systems, consultation, feasibility studies and design services. Peter McPhee: Certificate of ICI Apprenticeship Completion; Blue Seal; Certificate of Qualification; 309A-Electrician – Construction and Maintenance; Interprovincial Red Seal; Certificate of Qualification; Field Safety Representative Class B (FSR); Electrical Contractor Licence; Bonded and Insured. Spark! has 11 years of experience in off grid solar and wind installations and grid tied solar installations on Haida Gwaii. Spark! partners with Canada’s leading distributors to offer competitive pricing. We are available for free site assessments including energy conservation advice, and we can provide detailed system designs and quotes. We have staff available 24 hours a day for system troubleshooting. Our staff now includes an in house journeyman electrician. If you would like your business added to this list, contact us at: info@swiilawiid.org.